The up-to-the-minute content on the online portal "Daimler Brand & Design Navigator" presents Daimler's mandatory Corporate Design rules which are binding for all companies bearing the corporate name: Legal Entity Policy D 1715.0 in the Enterprise Regulations Database (ERD) on the Employee Portal (available internally only). Daimler is well on course for continued success, and as one of the leading vehicle manufacturers, intends to shape the mobility of tomorrow from the front rank. The 2017 Annual Report impressively shows which goals have already been achieved, and what action is under way for the future. Further information on the concept of the 2017 Daimler Annual Report is available from Karin Schurr (karin.k.schurr@daimler.com). The 2017 Daimler Annual Report combines financial information, facts & figures and background stories. Under the heading #1, the image section shows that the four strategic action areas – CORE, CASE, CULTURE and COMPANY – have the utmost priority on the road to the top position in the future. The front cover page of the Annual Report presents the Concept EQA. It is the first fully electric EQ concept vehicle by Mercedes-Benz in the compact car segment. As a trailblazer, the EQA provides an outlook on the impending electric offensive and the mobility of the future. The front cover motif extends around the entire front and rear cover, and variants can also be found inside. Distance between two lines measured from the descender of the upper line to the ascender of the ... vehicle manufacturer into a mobility provider – and plans to occupy a top position here too. 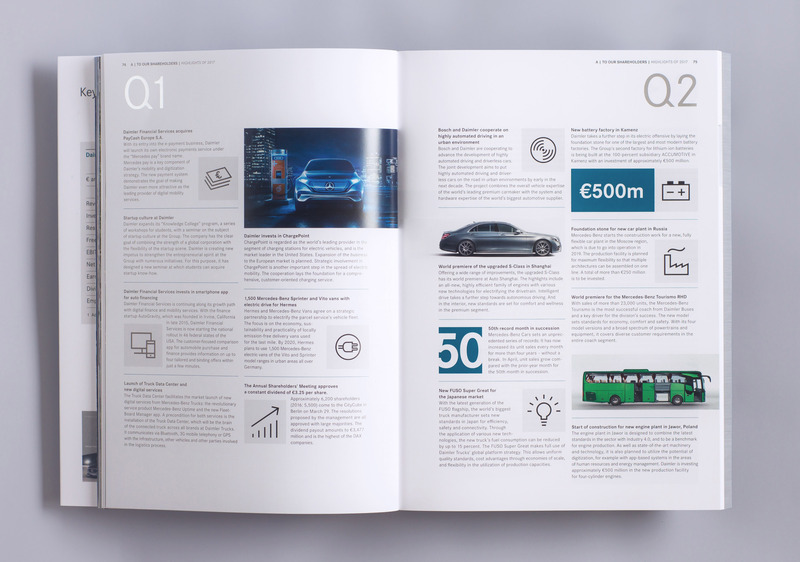 To make Daimler’s success visible and tangible, the 2017 Annual Report combines mandatory with image-related information: facts & figures plus design and background stories. Alongside financial information and facts & figures, the 56-page image section provides impressive insights into the corporate strategy that is driving this transformation forward. “With the four strategic topic areas for action – CORE, CASE, CULTURE, COMPANY – we are setting the course for a successful future,” Dr. Zetsche writes in his letter to shareholders. The concept and content of the image section are a logical consequence of this statement. Everybody is nowadays familiar with the hashtag character used in social networks – therefore the cover of the image section gets straight to the point with #1 in large characters: as one of the leading vehicle manufacturers, Daimler is shaping the mobility of the future. #1 underlines the high priority given to the four strategic action areas CORE, CASE, CULTURE and COMPANY in this process. The four Cs are the formula for success and are explained in detail in the following four chapters. The image section once again precedes the financial section, and its pages are of reduced width. 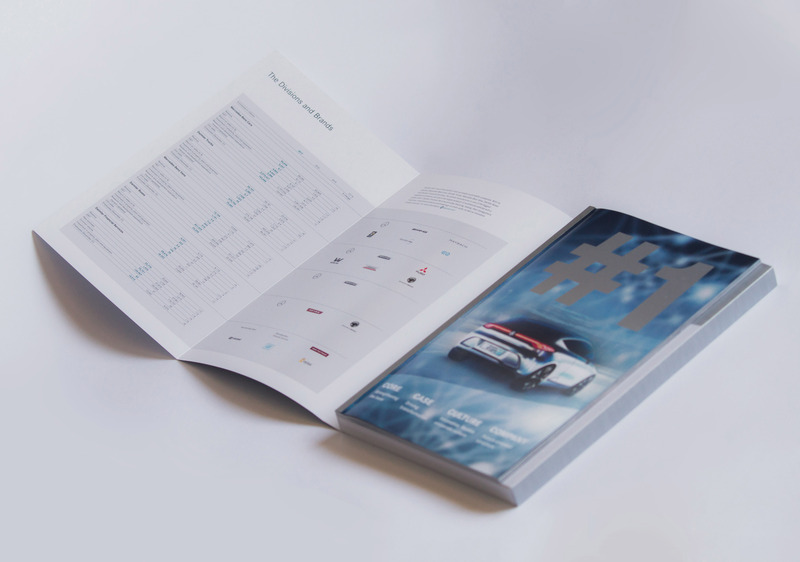 The Swiss brochure features a guard (a fabric strip reinforcing the brochure’s spine) in the corporate color silver – creating an attractive visual link with Daimler’s Corporate Design in every respect. Each of the chapters – CORE, CASE, CULTURE, COMPANY – is introduced with a double-page photo motif. In each case this is preceded by a white, transparent A4 page which lends a particularly appealing structure to the image section. The transparent page carries the key message for the relevant C. The statement is divided into two Tweets to generate a dramatic pause for effect. The use of Tweets is both reminiscent of last year’s report and a visual reference to the digital world. The new design manual provides a variety of magazine design possibilities. The cover of the image section shows the rear end of the EQA. Apart from the reduced page width, the new magazine design is immediately obvious. 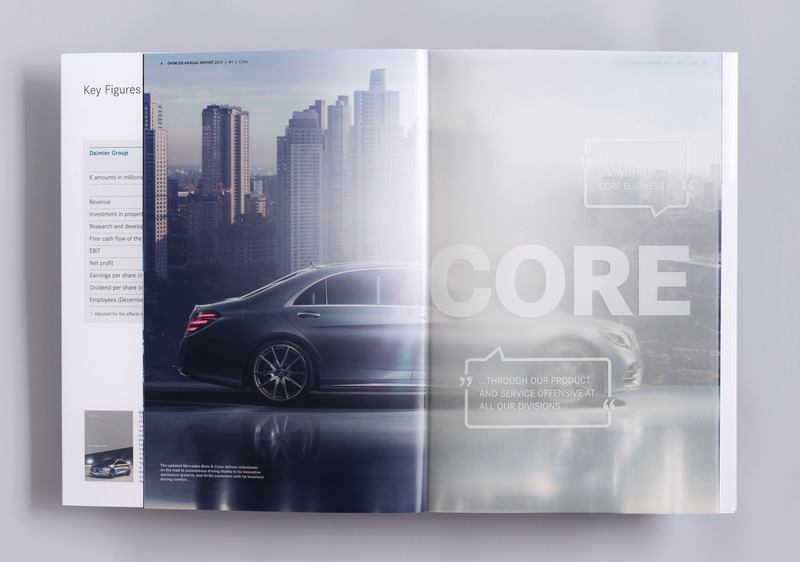 Daimler’s Corporate Design has considerably increased the design scope for magazines compared to brochures. The new design highlights are already visible on the cover page. The full-page EQA photo and the transparent raised area in the lower section have a strong emotive and expressive effect. Striking typography and the use of large capitals underlines the magazine-like character. Photos are also treated very differently. They are laid out in several ways in the image section, frequently positioned on the raising principle and always butted. The extensive array of photos is combined with generous areas of white, heightening their effect. As the letter from the Chairman is one of the most-read texts in an annual report, the message from Dr. Dieter Zetsche has a number of unusual features. The handwritten form of address and letter-like format speak to the reader directly. 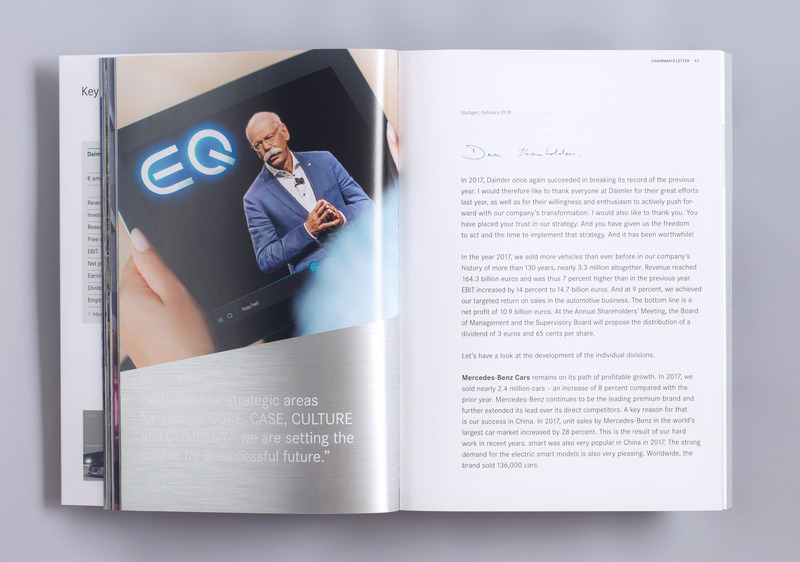 The portrait of Dr. Zetsche can be seen on the screen of a tablet – a modern, digital motif that presents the Chairman of the Board of Management as “always on”. The full Board of Management is generously presented on a double page. This allows space for the equal and individual presentation of each Board member: they appear informal and friendly in individual environments – in each case as a classical three-quarters portrait in a room, at a show or by a vehicle. The combination of portraits in a calm business environment creates a positive and active overall impression of the Daimler Board of Management. Extension of the backside cover to form a functional flap is a feature retained in the 2017 Annual Report. Designed on the raising principle and with the title “We are on course and are shaping the future”, key figures are shown here as an effective statement. Folded in directly behind the image section, the extended rear cover flap takes the reader directly to the Chairman’s letter and the image section preceding it. Clever guidance function: the flap leads the reader to the Chairman’s letter or to the image section. The “Highlights of 2017” chapter is in the new overall design. Intentionally laid-out in calendar form, the chronology shows the important events of 2017 in sequence. Supplementing the clear and systematic chronology, this section of the report is visually enlivened and enhanced by the use of Daimler pictograms. The skillful use of different materials lends the report a distinctive structure. Smooth photographic paper was chosen for the image section with its brilliant photos. The four intermediate transparent pages provide further highlights. The image section of reduced width is followed by the Chairman’s letter. As a clear contrast, this is printed on classical A4 stationery. The result is a logical separation but also a guide to the next section. The next haptic experience is the Facts & Figures section, thanks to the open structure of matt satin photographic paper. The use of distinctive paper types accentuates the particular nature of the individual report sections yet creates a harmonious overall impression. The seven chapter cover pages in the overall report carry dynamic, whole-page product photos. This creates a visual link to the image section cover. Key statements in the form of tweets are another continuous theme on each chapter cover page. This enhances the numbers-oriented report section and makes it considerably less formal. The layout provides the designer and requesting party with an impression of how a communication ... is retained in the Report section. This is where comprehensive financial information is presented transparently, clearly and in easily legible form. As a new feature, all charts and tables are shaded in grey-scale to further improve clarity and legibility. The urban graphic concept of the image section is continued on the pages devoted to the business units: with dynamic photos of vehicles in urban environments. There are no photos in the situation report and the financial statements. Naturally the 2017 Daimler Annual Report also meets the stringent requirements for compliance reporting. It takes due account of legal parameters and the growing importance of integrated reporting. Consequently, the extended chapter on non-financial reporting is a new addition. 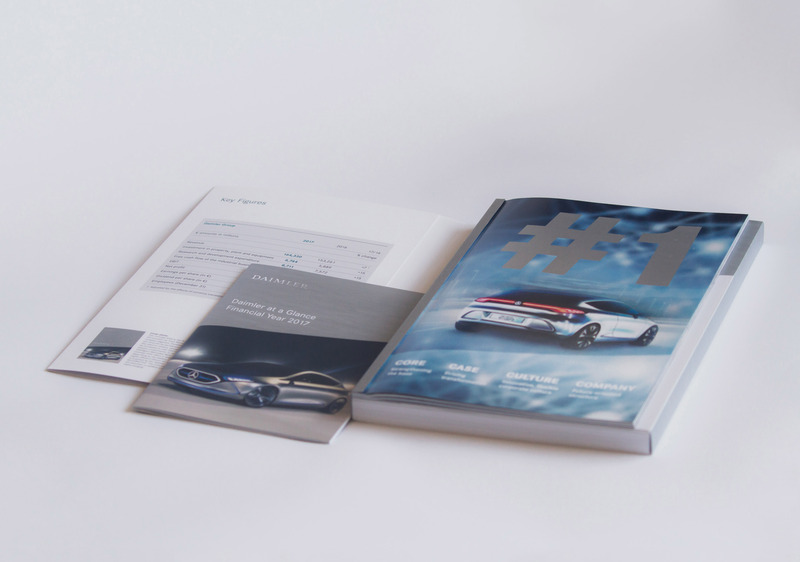 The A5-size brochure “Daimler at a Glance 2017” has the same appearance as the Annual Report: with the Concept EQA from Mercedes-Benz as the cover motif. As a new feature, the accompanying brochure with the key facts & figures in compressed form is no longer inserted in the report front cover, but sent with it separately. It can however also be used as a stand-alone, or distributed with other media such as the 2018 Daimler corporate brochure. The 2017 Daimler Annual Report is also available online – as a tablet and smartphone-optimized, animated version. A PDF download is also available in addition to the interactive version. The graphic and design idiom of the online report follows that of the printed version, but is enhanced with numerous videos, downloads and links. The 2017 Online Report is available at http://ar2017.daimler.com. Your comments are welcome. Please login to add your comment. Please read the Comment Terms and Conditions carefully. Daimler AG is one of the biggest producers of premium cars and the world's biggest manufacturer of commercial vehicles with a global reach. We provide financing, leasing, fleet management, insurance and innovative mobility services. The Brand & Design Navigator online portal supports employees and external service providers with information on the Daimler AG's Corporate Design and its brands — from the basic elements to their practical application as well as layout templates and best practice examples.